Improper weightlifting technique can cause soft tissue injuries of the arm. Common injuries include ligament sprains, muscle and tendon strains and tendonitis. Although pain is a common symptom of these injuries, inflammation and loss of function may also occur. Most of these injuries are preventable, but when injury does occur, treatment should include rest and ice. Tearing or excessive stretching of ligaments is called a sprain. On the other hand, tearing or excessive stretching of tendons or muscles is called a strain, notes MayoClinic.com. The severity of strains and sprains is categorized by degrees: first, second or third. First degree is mild and third degree is a complete rupture or tear. Sprains may occur in the ligaments of the shoulder or elbow. Strains may occur of the biceps brachii, triceps brachii and the tendons of these muscles. Another injury of the tendon is tendonitis, or chronic inflammation. Pain is a common symptom of these soft tissue injuries but may vary in intensity dependent on severity of the injury. The injury and pain may inhibit normal movement of the arm. For example, a rupture of the biceps brachii may prevent proper movement of the elbow. Inflammation and point tenderness at the injury site are also common. For muscle strains, spasms or cramping may also occur. Improper weightlifting technique may cause arm injuries. For example, during an overhead dumbbell press you should see your arms in your peripheral vision, otherwise your arms are too far back, increasing the risk for injury. Arm injuries may also occur during lower extremity lifts. According to the book "Strength Training Anatomy," the stress of holding the weights even during lower extremity lifts such as a deadlift may cause injury to the upper body. Weightlifting too frequently without adequate recovery and increasing weight increments too quickly may also lead to injury. To prevent injury and pain of the arm, use proper weightlifting technique, allowing adequate recovery and increasing weight slowly. 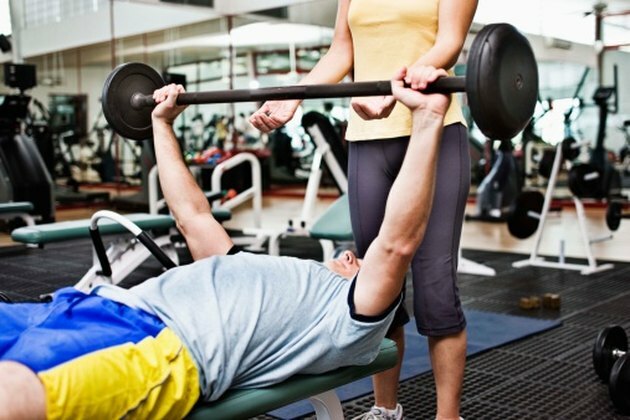 For inexperienced lifters, a personal trainer can provide the necessary guidance and reduce the risk of injury. If an injury does occur, treatment should start with rest and ice for the first 48 to 72 hours. Heat should not be applied the first few days following the injury but may be applied thereafter. Heat should be applied prior to activities but not following. Ice may be applied anytime, but especially following activities. Heat or ice for 15 to 20 minutes two to three times daily. If symptoms do not improve -- or worsen -- seek medical attention. American Academy of Orthopaedic Surgeons: Sprains and Strains: What's the Difference? National Institute of Arthritis and Musculoskeletal and Skin Diseases: What Are Sprains and Strains?